I just got a new bicycle. 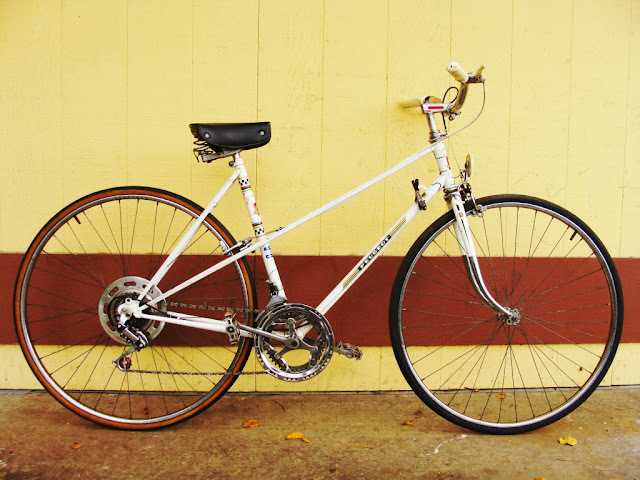 Her name is Isabella and she is a vintage Peugeot, made in France circa early 1970's, and I LOVE her. But she is an old girl and has needed a bit of help - new tires, brake adjustments, rack installation, etc. The usual stuff that can cost upwards of $100 for labor alone if I were to take her to a bike shop. And it just so happens that my friend Kevin is a bicycle superhero. So we've arranged a trade: I will knit a baby blanket for an upcoming nephew, and he will assist with my bicycle stuffs. I let Kevin pick the pattern and colours, and I am SO HAPPY with the choices he made. I love wacky bright colours for baby blankets. This is my first ripple afghan, and I'm totally hooked! (no pun intended) I'll be making a lap-sized version for my couch once the weather cools off. I think I started by chaining 139 sts though I don't entirely remember. Worked 4 ridges (8 rows) sc of each colour per stripe, 12 stripes total. My finished blanket is approximately 28" wide x 32" long. I had meant for it to be a bit wider, so if I were to make it again in baby size I'd likely do one additional repeat, but this is perfectly adequately baby-sized. I used about 1.5 skeins of each colour (one half skein for each stripe). I had meant to use all the yarn, but that would have been a very long and narrow blanket. And now I have enough leftovers to make a matching baby sweater!